Laser Technologies has an arsenal of in-house manufacturing solutions available to address fabricated component punching and pressing requirements. 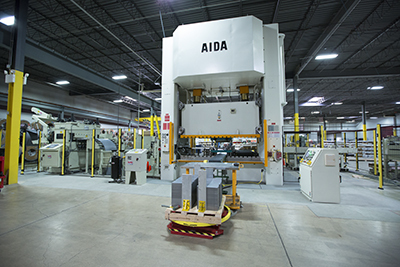 Our capabilities include a range of different sized stamping presses, hydraulic presses, and a turret punch press. Laser Technologies' estimators and engineers will help determine the most feasible and cost effective approach to your particular component requirements. 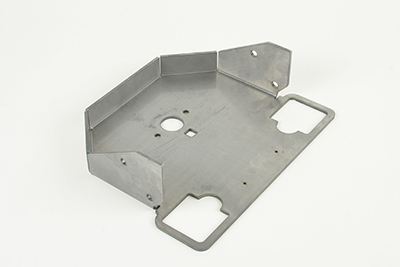 Stamping is the process of placing flat sheet metal in either blank or coil form into a press where a tool and die surface forms the metal into a net shape. A dedicated stamping die is built for your particular workpiece. There is a higher upfront investment cost and longer lead time associated with building a die; however, the overall cost of manufacturing tends to be lower providing there are enough parts to amortize the cost of tooling over. Stamping is a good solution for medium- to high-volume work. A turret press is a type of punch press used for metal forming that utilizes individual punching tools that are stationed in a rotary turret. This type of tool setup eliminates the cost of expensive, dedicated stamping dies. Our turret punch press is CNC-controlled, with automatic positioning of the metal sheet beneath the tool. 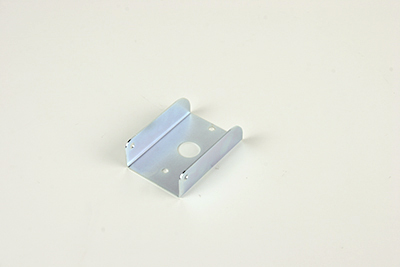 CNC turret punching is a good solution for small- to medium-volume work. A punch is less flexible than a laser for cutting compound shapes, but faster for repetitive shapes. A hydraulic press is a machine that uses a hydraulic cylinder to generate a compressive force. This type of press is typically used in conjunction with a tool or fixture to perform a particular operation such as applying pressure to a stacked core or seating fasteners. Laser Technologies has a variety of hydraulic presses with capacities up to 150 Ton.